Gum disease doesn’t have to happen to you, but if it does, find out what you should do to treat it. Gum disease happens to millions of Americans, and yet it is a condition that is completely preventable with the proper oral care; however, not everyone visits their Lindenhurst, IL, dentist, Dr. Brian Gniadek, as often as they should to get routine checkups. This is why coming in every six months is so important not just for healthy teeth but also healthy gums. If you come in every six months to visit your Lindenhurst, IL, general dentist, as you should, then you’re getting screened for gum disease and probably don’t even realize it. The screening only takes a couple of minutes and it’s completely painless. We will use a small probe to check for spaces between your teeth and gums where there could be infected pockets. Larger pockets are often an indicator that you have gum disease. Other signs of gum disease include chronic bad breath, loose teeth and red swollen gums. If we discover that you do have gum disease, do not despair. The next step is to try and figure out the severity of your gum disease. If we tell you that you have gingivitis, this early stage of gum disease can be reversed. Of course, full-blown periodontal disease can be managed with the proper treatments to prevent complications such as bone or tooth loss. The most common gum disease treatment is scaling and root planing. 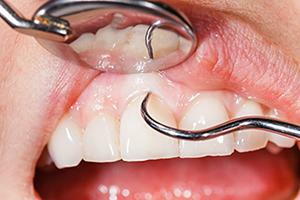 This procedure is essentially a way to deep clean the gum lines, under the gums and along the tooth roots, where tartar and bacteria can build up. By deep cleaning the gums and tooth roots we can prevent the accumulation of bacteria that make gum disease worse. Of course, there are some patients who can benefit from at-home treatments while those with more severe cases may require surgery or laser surgery in order to properly treat the infection. If you are noticing any changes in the health of your gums, it’s important that you call our Lindenhurst, IL, dental office right away for a checkup. In its earliest stages, gum disease can even be reversed if you get the proper care. Call us anytime with questions or concerns about your oral health; we are here to help!